Welcome to First Impressions, where I relay my experiences of a game’s opening moments. 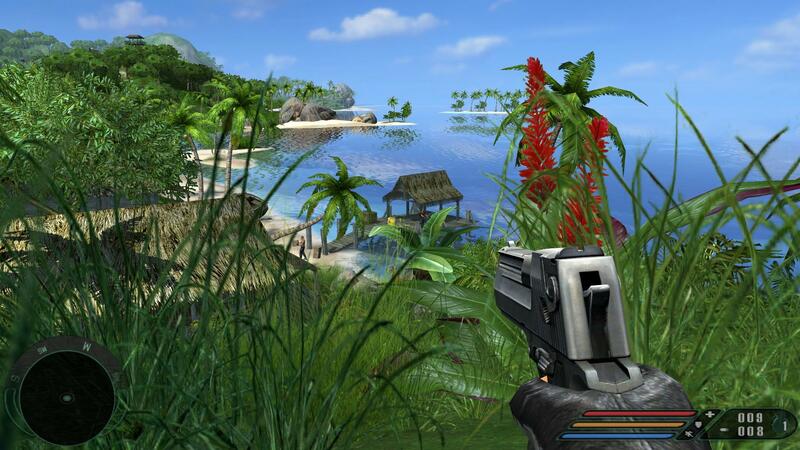 The original Far Cry is essentially Predator: The Video Game. But instead of playing the part of a freaky outer-space alien hunting Army jocks, you’re a freaky Hawaiian shirt-clad jock hunting other mercenary jocks. After a brief tutorial, the game sets you free in a beautiful tropical vista. Saltwater shimmers in a nearby bay, reflecting the image of far-off beaches. A flock of birds flies in front of you from right to left, inviting your eyes to notice the scope of the environment in front of you. On the dock below, a mercenary absentmindedly holds a fishing pole while two others walk back and forth on the beach. This is the moment that defines Far Cry. Freedom. Freedom to approach the situation how you want to. You could start shooting from your elevated vantage point, attempting to blow up the yellow container of fuel on the dock. You could sneak down closer to the structures, engaging enemies at close range. Or you could circle around to the left, avoiding confrontation altogether. A game that gives you options: this is Far Cry’s claim to fame. Yes, it took me three shots to explode the barrel. Don’t judge me, that’s a long way for a pistol shot. I opt to go loud. It takes me three shots to make the barrel go boom. The fishing merc got thrown off the dock by the explosion and is now bobbing in the water, face down. Another mercenary charges up the hill towards me, firing as he runs. Panicked, I return fire. It takes a surprising number of bullets to his torso before he slumps to the ground. Enemies in this game are tough! I walk down to the hut, hoping to find a needed medkit and maybe other items of value. There’s a a machete on the table, but I can’t imagine getting close enough to enemies to use it on large islands like this. On my way out of the hut I come face to face with an enemy I wasn’t expecting. He lights into me as I reflexively fire my pistol. Somehow I land a hit to his face that drops him instantly. Useful fact: headshots are extremely effective in Far Cry, if a bit difficult to pull off. Doyle, an ally, is talking to me via the video-phone I picked up in the game’s tutorial. I’m not sure how the phone gets a signal our here on these remote tropical islands, but you can’t argue with a plot device! He directs me to another small shack on the top of a hill. Here I find some high-tech binoculars and spy on the next enemy encampment. Doyle informs me that all mercenaries are conveniently tagged with microchips by the bad guy’s administration. These trackers work in my favor. Once scanned by the binoculars, enemies show up as an arrow on the mini-map. Green means they have their guard down, yellow indicates they’re alert, and red means actively engaged and shooting bullets. The mini-map is useful even if you haven’t tagged any enemies from afar off. Loud sounds are registered as oscillating circles in their approximate location. The bars on either side of the map serve as a “detection meter”, indicating how easily enemies are able to spot you. There’s a lot of information packed into that corner of the screen, and it does a good job supplementing your visual observations without feeling like it makes the game too easy. 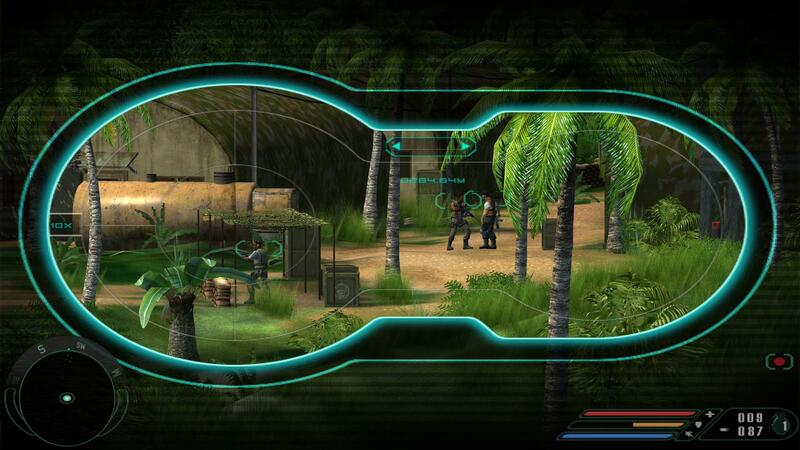 Using the binoculars, I spy on the next enemy encampment and tag five enemies. There’s a shallow bay between me and the camp, so my only option is to go for a swim. A guard tower looms overhead, and I’m worried that my presence on a beautiful beach is painfully obvious to a man with a large gun. Somehow, he doesn’t see a muscular dude in a red Hawaiian shirt swimming ashore. Walking a little farther inland I crouch down and line up a shot with my pistol. I pop off a few rounds that should have been direct hits, but the bullets don’t register. The guard doesn’t even react to the sound of gunfire. Huh. I guess I’m too far away. As I creep closer and start spraying bullets around, the whole camp knows I’m here. Since I’ve tagged enemies with the binoculars, I’m able to fade into the jungle and avoid them. Tiny red arrows become large red arrows as I maneuver to line up my shots. When necessary, I toss rocks to cause distraction and lead the enemy where I want him to go. I am Predator. All enemies are subject to my mercy. Except for the ones that I missed when scouting the camp and therefore don’t show up on my map. My screen fills with a red glow as gunfire erupts from behind me. I turn around to see a merc lighting me up. He shoots me. I absorb bullets. I die. Subsequent attempts to clear the camp go much better. It takes my brain a little while to settle into the slow-ish pace demanded by the game. It actively discourages running and gunning; this is Predator Simulator, after all! Mercenaries are good shots, and you are susceptible to damage. Prepare to die quickly if they see you before you see them. That’s quite a challenge with all the beautiful and dense jungle foliage covering every island. It’s happened more than once that I burst through vegetation into a clearing only to be greeted by an enemy and a stream of hot lead. This is where the smart-tagging binoculars come into play. Stop frequently to scout thoroughly and make sure you know the location of every enemy. Thankfully the goggles aren’t totally dependent upon line of sight and can tag enemies even through thick vegetation. They are absolutely essential to survival. When it is time to engage in a firefight, the game forces a methodical approach instead of haphazard running and gunning. Firing from the hip while moving will spray bullets over a wide area; it’s rarely effective, even at close range. Stopping to crouch and aim down the sights nearly guarantees a hit, but also makes you an easy target. For those long-range shots, go prone to make it count. As someone who is rarely able to do well in twitch shooters that reward reflexes, I appreciate Far Cry’s methodical approach to combat. It lets me be the hunter. There’s a lot to take in while playing Far Cry’s opening level. It pulls no punches, showing you everything the game is about. It’s a big, dumb shooter that doesn’t pretend to be anything else. 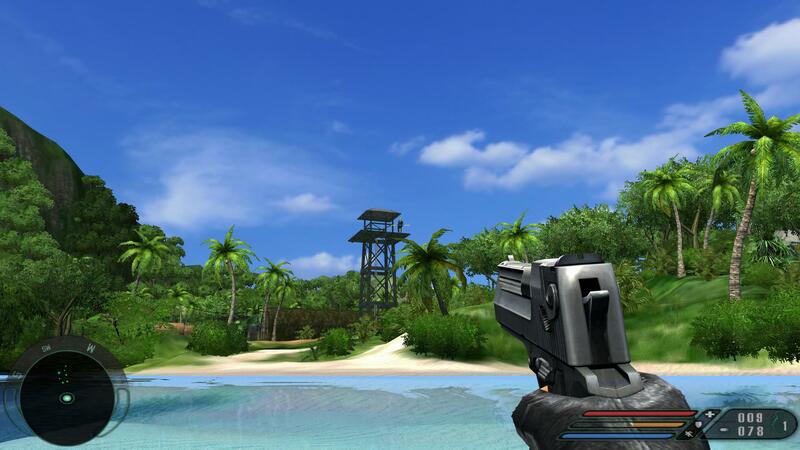 You and a bunch of guns against a whole archipelago of islands full of baddies and mutants. What more could you want? A foreshadowing of things to come. Enemies believe that the shortest distance between them and you is a straight line, even if there’s a cliff in the way. Indoor combat demands lots of peeking around corners. What do you think happens when you cut one of those chains? Scientist + Remote Island = Evil. Let’s go bowling for mercenaries! Star Wars: Battlefront – Beauty Without Soul?